One of the questions that new moms ask doctors frequently is when their baby will start teething. Usually, children get their first two teeth when they are four to seven months old. However, it is not unusual for babies to get their first teeth when they are around three months old, and nor is it unusual for the first teeth to erupt at age one. Children start developing teeth while they are still in the mother’s womb. But during this time, the tooth buds form within the gums, only to appear months later. The usual pattern of teeth appearance in infants is with the bottom two middle teeth appearing first, followed by the top incisors, and then with the growth of the teeth along the sides and the back. The molars appear last, usually when a child is around three years old. 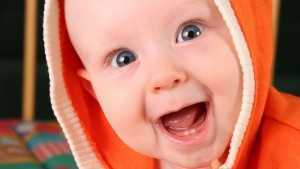 If you find that your baby’s teeth do not appear straight when they erupt, you should not panic. More often than not, this issue fixes itself gradually. At the age of three, your baby grows the entire primary teeth set – 20 teeth – which remain until the permanent teeth appear. The first permanent tooth usually appears when your child is around six years old, and this is also the time when the primary teeth start to fall out. What do babies feel while teething? There is a difference of opinion among experts about the effects of teething on babies. Leading experts believe that teething isn’t directly responsible for the symptoms like fever, diarrhea or fussiness which babies exhibit while teething. Instead, they are of the opinion that these symptoms are caused by the natural tendency of babies to put anything inside their mouth to sooth the gums. While some babies have a fuss-free teething, many parents complain about their babies expressing distress and discomfort while teething. These commonly-reported symptoms include fussiness, drooling, gum swelling and sensitivity, gnawing tendencies, loss of appetite and sleep disorders. Some parents also believe that teething induces fever, diarrhea or runny noses, but according to the American Academy of Pediatrics, there is no direct connection between the last three symptoms and teething. If you see that your baby is running high temperature coupled with lethargy, loss of appetite and vomiting, you should bring your child to the doctor. Get a hard tooth biscuit to chew on. However, be very careful about choking. If you have exhausted the home remedies and your baby is still in pain, you can give pain relievers meant for infants. Never give any prescription medicine to your baby without consulting a doctor. You also need to regularly clean your baby’s gum before she sprouts his or her first tooth. Make it a habit to wipe the gums with a gentle and wet cloth while giving baths. This is a great habit since it gets your baby used to teeth brushing when the time comes!